Get in the driver�s seat! The PitStop GT Receiver Chair is the ideal seating option for any home or office setting. PitStop racing-style furniture offers you the unique opportunity to provide guests with functional seating options, while expressing your enthusiasm for motorsports. The PitStop GT Receiver Chair is no exception. With a sturdy alloy base and comfortable bolstering, the PitStop GT Receiver Chair makes the perfect addition to nearly any setting. 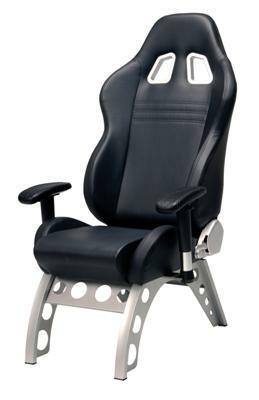 The PitStop GT Receiver Chair is designed to resemble the bucket seat of a racecar. The GT chair is constructed from bolstered leatherette and has an adjustable seatback provide comfort and support while you maneuver the curves of your work day. Tire tread embossed adjustable armrests offer three height levels to ensure comfort. The steel alloy base features four legs for stability. PitStop furniture doesn�t just look cool�it�s ergonomic, too! The PitStop GT Receiver Chair features careful ergonomic styling, with comfort bolstering for lumbar support and a generous high back. Whether you�re watching the big race or drawing up an important business contract, the PitStop GT Receiver Chair provides comfort for the duration.